Since I was flying solo for dinner tonight, my mom and I decided to have a girl’s night and check out the new Fresh & Easy Market that just opened. While we weren’t planning to make it a full shopping trip, we challenged ourselves to scope out the offerings and find something fresh and easy – and vegan, for dinner. Good thing I wasn’t checking off a long list on this trip, not sure I handle this crowd after a busy day at work! My first impression walking into the store was good, it seemed to have a warm and clean atmosphere which was a nice contrast to the gray and rainy weather that’s in the forecast all this week. 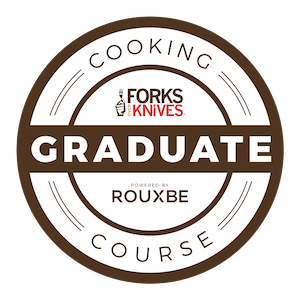 When I started looking at the ready prepared meals, the first thing I noticed was the lack of vegan and even vegetarian options. Ugh, plenty of beef, chicken, and fish, but no tofu, tempeh, or even quinoa and beans. 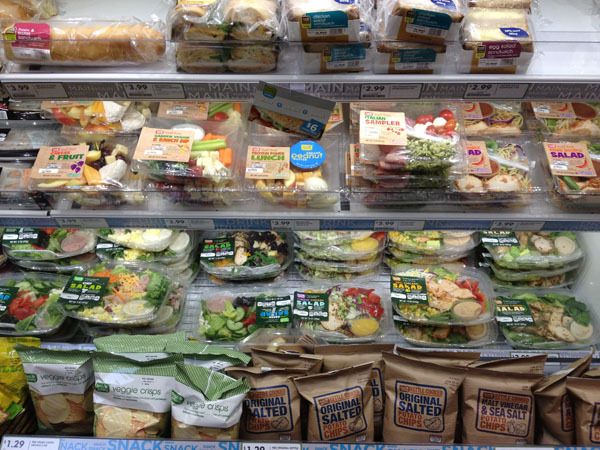 Even all the salads had some sort of cheese, meat, egg, or all the above in it – very disappointing. Maybe it’s too soon to judge since the pickings were slim after the grand opening or maybe someone in marketing figured vegans wouldn’t be looking for grab-and-go meals sealed in plastic. After browsing through the aisles and rechecking the fresh take home meal options, I ended up checking out with 4 avocados, veggie chips, organic rice cereal, and these 3 items for dinner for $15. I was disappointed to not find tempeh among the tofu and vegan meat alternatives section, guess I’ll still be making frequent trips to Trader Joe’s to stock up on it still. And that cute little block of firm tofu was the largest they had for high protein tofu. 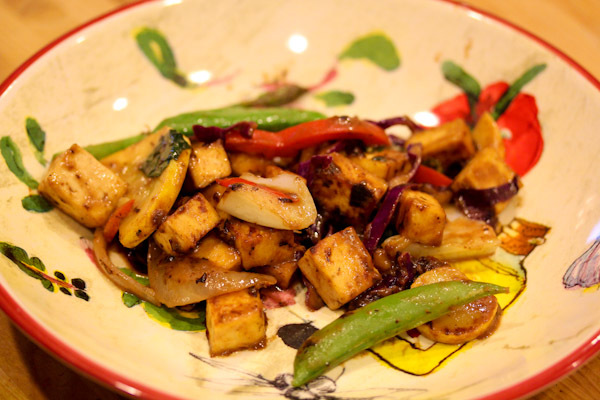 The exotic stir fry veggie mix was a pretty good value with an easy mix of asparagus, sugar snap peas, red bell peppers, cabbage and other veggies busy people might night buy and prepare separately. 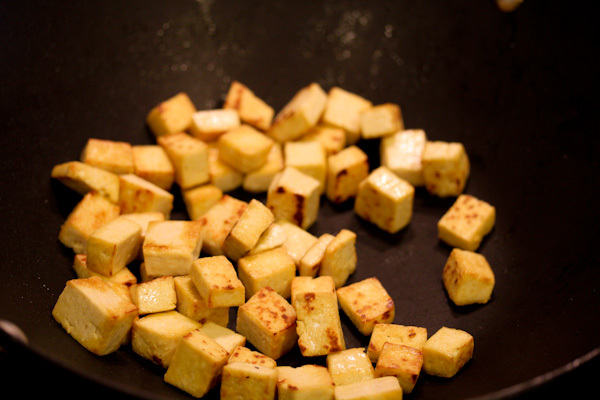 I cubed up the firm tofu and stir fried it by itself in olive oil until the chunks were golden and slightly crispy. Then set aside while I added the veggie stir fry mix and peanut sauce to the wok and re-added the tofu once the veggies were coated in sauce. And dinner was served in about 10 minutes, I’d call that fresh and easy. 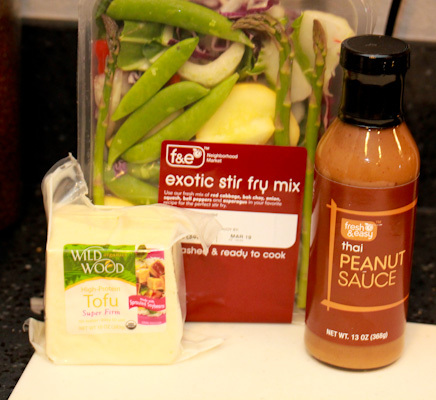 The peanut sauce had a nice peanut butter flavor to it that wasn’t too strong and didn’t over power the veggies. 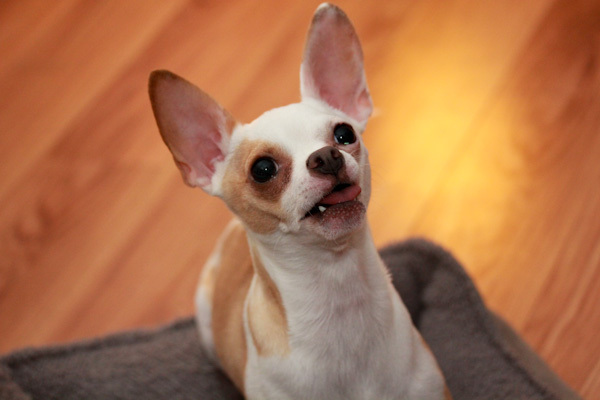 After dinner we had a play session with the dogs, but as usual Miko stole the show being the most active and attention hogging of the three chihuahuas because he just loves having company over. 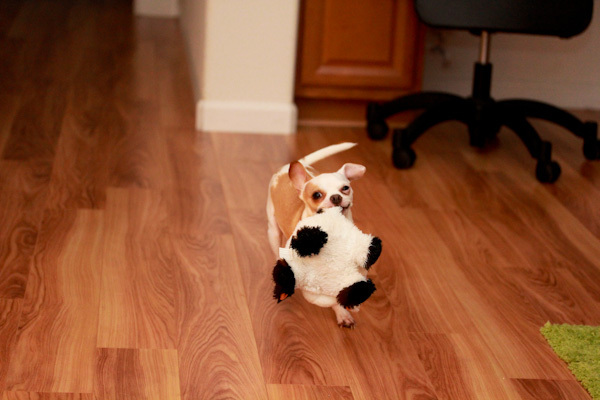 And showing off racing around the house with his toy. 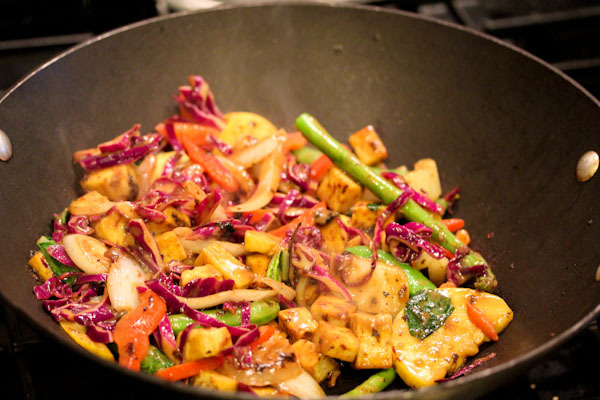 Your stir fry is gorgeous!!!! 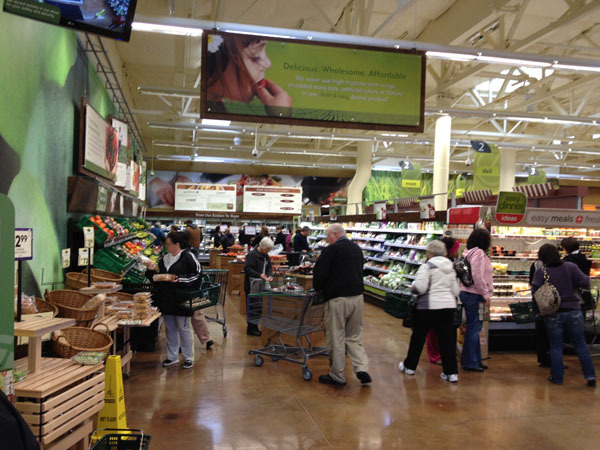 The regular grocery stores don’t have Wildwood either, but Whole Foods usually has it for a good price – go for it. :-) Their high-protein stuff is probably my favorite tofu already pressed and easy to cook. You’re so lucky on TJ’s, the closest one to me is about 20 miles, so I plan to load up when I go. Thanks for coming in for a visit! I did want to share something that you may find helpful and enlightening – we actually have a product list of items available throughout our stores (the list has everything we carry so it may vary a bit store by store) that fit into vegetarian and vegan diets. http://www.slideshare.net/FreshandEasy/fresh-easy-neighborhood-market-vegetarian-vegan-shopping-list It’s also available on our website under the section titled ‘Good Food You Can Trust’ along with several other dietary-specific shopping lists. 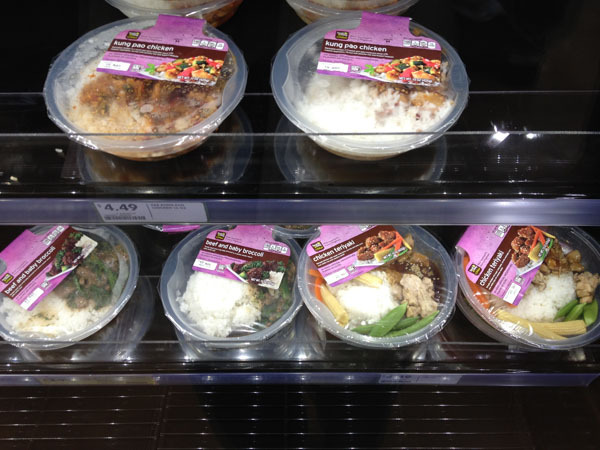 You’ll see on there that we do actually have a few vegan-friendly prepared meals. Though you’re right that we don’t currently have tempeh – I’ll let the team know you (and probably the vegetarian/vegan population at large) are looking for that from us. Thanks so much! Thank you for the update, I will check out that list before my next visit. Thank you on tempeh, it’s a great high protein food that I prefer more than tofu, so being able to buy it closer to home would be wonderful! Glad I looked at the comments – I wouldn’t have even bothered to check the store out! I think we are getting one in the land park area soon. It’s a good store to get in and out of quickly. That’s disappointing and surprising– I can’t believe they had barely ANY grab and go vegan meals! !